I have seen several boasts of attendance figures of “a few thousand” for this thing (I can’t find them now). I find this event to be equal parts terrifying and amusing. Serious chiropractors across the world should be terrified if these people are gathering in such numbers to drag their profession through the sewer. To hear health experts proudly speaking their truth (yes outside Australia they are actually allowed too…Cal Jam is the BEST “health event” we have ever been too. I’ll get back to that list of speakers shortly. While it is obviously professionally unwise for the Floreanis to be spruiking an anti-vaccine event, filled with anti-vaccine names, and other crackpots, on their professional Facebook page, it is clear that they are no risk of censure given the inability of the regulator, the Chiropractic Board of Australia – who have thumped their chest about this sort of thing in public – to regulate. The CBA is so ineffectual that maybe it will take a ministerial or even a Senate inquiry to prod the Board into deregistering recalcitrant chiropractors. We have already seen Australian Vaccination Network member Simon Floreani cautioned by the CBA due to his anti-vaccinationism in this post – and how AVN member Jennifer Barham-Floreani has escaped censure for her anti-vaccine book, also contained in the preceding link, I am bemused. One of the names listed as a speaker at CalJam is Tim Shakespeare, himself under pressure from many regulatory sides. Nothing will happen to him either. It is to be expected. After pressure from medical authorities, the Chiropractic Board has decided to crack down on unscientific practices. Chiropractors are blamed by doctors for spreading too much misinformation on the inoculation debate. But high-profile chiropractors say they will continue providing information about both sides of the vaccination argument. Chiropractor and author Jennifer Bahram-Floriani says it will not stop her colleagues from giving patients advice. “Chiropractors will certainly be working towards making sure that the information that they convey to parents is the latest, up-to-date information that presents both sides of the vaccination debate,” she said. It is adorable that Barham-Floreani claims she provides “both sides of the vaccination argument”. Her book’s vaccination chapter does nothing of the sort. Maybe she is the rarity to whom she refers? ANDREW WAKEFIELD – obviously the king of the modern anti-vaccination movement, known to have a “callous disregard” for his underage targets. 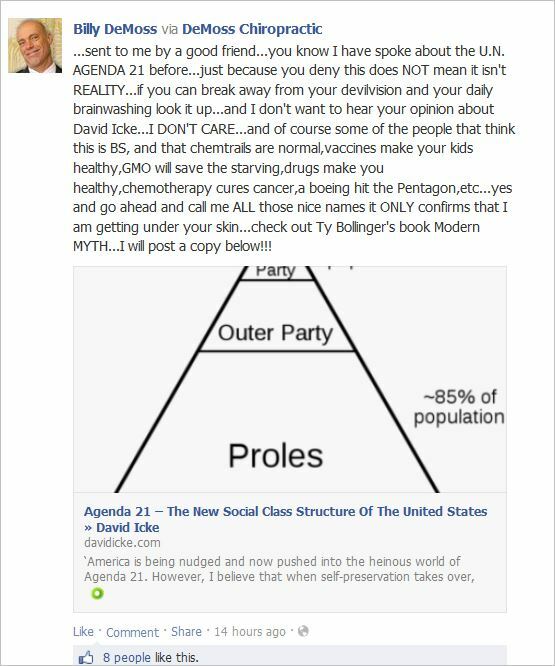 EDWARD GROUP – anti-vaccine chiropractor; conspiracy theorist; regular on Infowars; supplements seller. CATHY WENDLAND-COLBY – anti-vaccine chiropractor. BRAD GLOWAKI – anti-vaccine chiropractor; practice-building entrepreneur. DANE DONOHUE – anti-vaccine chiropractor. JAMES CHESTNUT – anti-vaccine chiropractor. DANNY CONSTABLE – anti-medicine subluxationist (from what I can gather all chiros here are subluxationists). TIM YOUNG – anti-vaccine chiropractor. JJ VIRGIN – promoter of fad diets and supplements; promoter of Mark Hyman (MMR/autism alternative doctor). DEED HARRISON – anti-vaccine chiropractor. TIM O’SHEA – anti-vaccine chiropractor. JEANNE OHM – anti-vaccine chiropractor. DAN MURPHY – anti-vaccine chiropractor. FULLYRAW KRISTINA – anti-vaccine raw food advocate. ADJUSTASAURUS REX (YEHAR our very own flesh and blood!!!) – anti-vaccine chiropractor Tim Shakespeare, who really refers to himself as this. PATRICK GENTEMPO – anti-vaccine chiropractor; practice-building entrepreneur; appears on Infowars. ANTHONY GUCCIARDI – claims to have treated his Lyme Disease with colloidal silver; natural health empire; regular on Infowars. ALEX JONES – Big Daddy enraged conspiracy nutbag; Prison Planet; Infowars; lives whole life only 10 seconds from several catastrophic health events. JEN FRANCO – nutritionist who often talks at DeMoss’ chiropractic business. CAROL ANN MALIZIA – chiropractor who offers dubious treatments in her business, including breast thermography. ROBERT SCOTT BELL – anti-vaccine conspiracy theorist; podcast on Natural News site. JOHN MINARDI – makes a living teaching about the vertebral subluxation complex. BARRY ANDERSON – anti-vaccine chiropractor. I am really happy that many moderate chiropractors are standing up to these people. And it’s now happening all over the world. Because, if the resistance to the utter crackpottery such as CalJam doesn’t grow, your profession is doomed. In Australia we’re a little luckier in that we have legislation and regulation in place to hold these people to account. In the US this seems to be sorely lacking. Still, in Australia, there appears to be little which can be done when the minority of the profession – the subluxationists and anti-vaccinationists – hold the sway on the boards of many representative associations around the country. For goodness sake the largest peak research organisation – the Australian Spinal Research Foundation – has a board which is 89% anti-vaccine, which is founded on the study of that which does not exist! This entry was posted in anti-vaccination dishonesty, chiropractic, Immunisation, skeptic, stop the australian vaccination network and tagged Adjustasaurus Rex, Alex Jones, Andrew Wakefield, Anthony Gucciardi, ASRF, Australian Health Practitioner Regulation Agency, Australian Spinal Research Foundation, australian vaccination network, Australian Vaccination Skeptics Network, AVN, AVsN, Barry Anderson, Billy DeMoss, Brad Glowaki, CAA, CalJam, Carol Ann Malizia, Cathy Wendland-Colby, CBA, chemtrails, Chiropractic Board of Australia, Chiropractors' Association of Australia, conspiracy theorist, Dan Murphy, Dane Donohue, Dane Wigington, Danny Constable, Deed Harrison, dishonesty, Edward Group, Fully Raw Kristina, Healing Wave Chiropractic, James Chestnut, Jeanne Ohm, Jennifer Barham-Floreani, Jennifer Franco, John Minardi, Patrick Gentempo, Robert Scott Bell, Simon Floreani, Tim O'Shea, Tim Shakespeare, Tim Young JJ Virgin. Bookmark the permalink. Yep – and “yes outside Australia they are actually allowed to”. Such hubris and scorn for regulation. Time for some action. Think Globally, Act Locally. Everyone who is a regular reader should identify their local chiroquactors. Then, post on their (i.e. each one’s) FB page, asking them directly whether or not they support vaccination. Forward our results to Hank. The collated list can then be sent on to CBA, with a CC to federal and state health ministers, and the press. Too……why, why is it that ignorance seems to go hand in hand with illiteracy? Since he was once an actual, for-real medical doctor, one wonders whether Mr Wakefield has always held chiropractors in such high regard. And since he was once a GI research surgeon, one wonders how he became an expert on vaccination. I’m toying with the idea of becoming a chiro…and then whole heartedly supporting public health measures like immunization, public health etc, just to f@ck with these a-holes.